We often use WhatsApp as a platform for sharing photos, music and video clips with our contacts who live across different regions. But these media files are compressed before being uploaded to WhatsApp servers, in such a way that their original quality is lost. In a recent article, we have mentioned a workaround in which you can share full quality images, audio and video clips on WhatsApp. But high quality media files are often also large in size. A 5 minute FLAC audio file comes around 40 to 60 MB, while an average music video in 720p resolution comes around 70 to 90 MB. 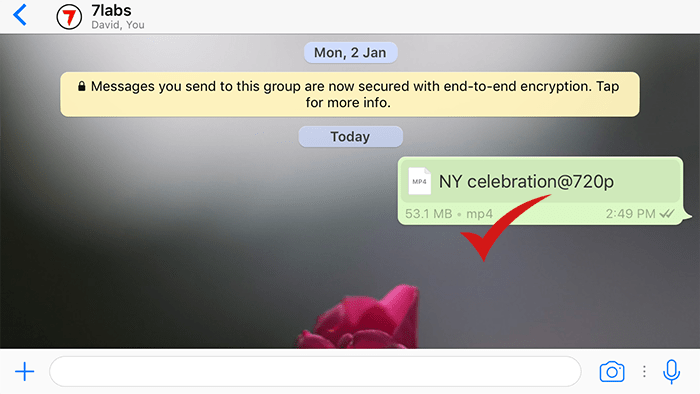 WhatsApp has a general upload limit of 16 MB for any type of media file (photo, music or video). Probably, the only high quality media files you can share within that limit are the average 5-minute MP3 files of 320 kbps bitrate. So in fact, the ability to send high quality media files on WhatsApp is not much useful unless we can overcome that 16 MB upload limit. And the good news is, indeed you can share files larger than 16 MB on WhatsApp. Note: The following method only works with the iOS version of WhatsApp (sender). The receiver, on the other hand, might be using WhatsApp on any platform (iOS, Android, Windows). The method used here is the same one mentioned in our previous article, which helped to bypass WhatsApp’s media compression algorithms. When you’re sharing a document on WhatsApp, it allows you to pick files up to 128 MB in size. Of course, this size limit is not enough to share an HD quality movie (who does that anyway? ), but you can easily share high quality videos or music files on WhatsApp using the below method. As with document uploads, WhatsApp allows files to be picked from other third party apps that implement Document Provider extension. We have used Documents as the third party file picker app. The below steps demonstrate how to share large photos, music and videos on WhatsApp, using the Documents app. Import the large file (less than 128 MB) that you want to share on WhatsApp, into Documents app’s file storage, via Share menu, iTunes or any other suitable means. Select Documents app from the list of third party apps and choose the desired file from its in-app storage. The selected file will now be uploaded to WhatsApp, available for the recipient to download irrespective of the platform he’s on. The file size should be less than 128 MB. If a larger file is shared, a pop up will be displayed, notifying you that you can only share “documents” up to 128 MB in size. Tell us about your opinions on the unique workaround to bypass WhatsApp’s 16 MB file upload limit, in the comments below.